I went to Frankfurt, Germany for work not to long ago (more on that in another post) but for anyone who has been to Europe: it’s not always about the place you’re visiting, but the places you get to visit on side trips. At my wife’s suggestion, we went to Strasbourg, France - and I found there a city that does biking and urban transit right. Where to begin: Strasbourg doesn’t allow cars in the city center. Now this is similar to the no-car policy of Paraty, Brazil but I think that is more of a result of cars getting stuck on, under and between the Kia Sportage-sized cobblestones. Strasbourg was smart enough to do it on purpose, and the picture above is what I’m talking about: you have whisper quiet trains running about that are clean, have huge windows, and look like they are from the future. And the motorman’s cabin, unlike the Bill & Ted phonebooth-sized ones on subways in the U.S., is a spacious wedge-shaped room that gives the driver of the train a full range of vision. And to top it off: the trains run so low to the ground it makes running someone over almost impossible. I didn’t try this - I don’t have a ‘Buster’ equivalent for this web site (Hi, Adam & Jamie! Loved the aqua bike episode!). 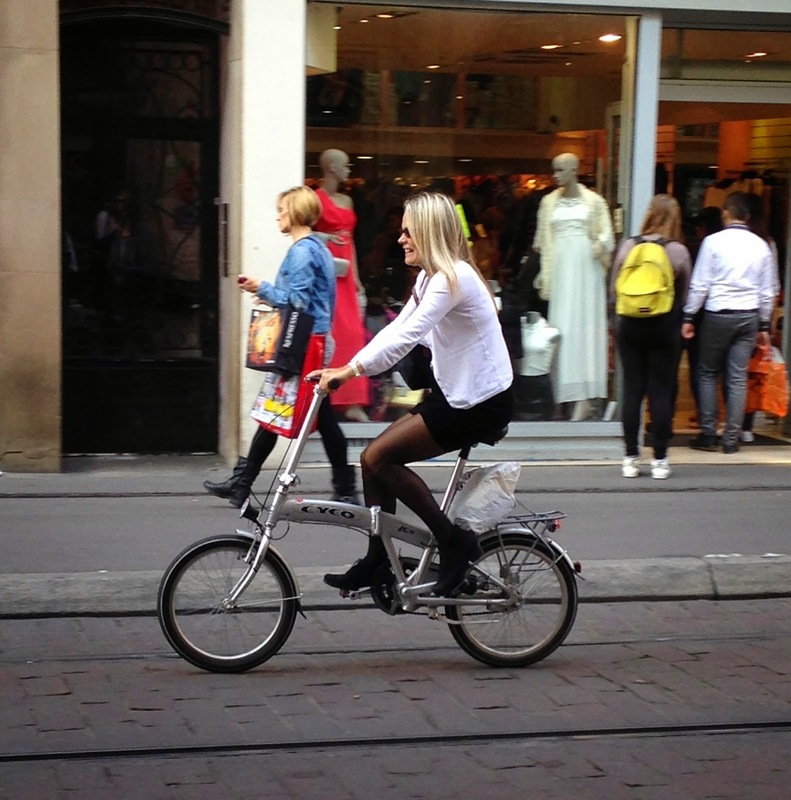 Strasbourg also showcased the kind of everyday cyclist I wish we’d see in the U.S. more often (or, rather, the kind of cyclist we’d see if elected leaders would throw more than table scraps toward Complete Streets). Note the smile. There are also trails and bike lanes almost everywhere you turn. This one, running along a river, made me smile when I thought about what the Mill River Greenway in Stamford could grow up to be someday. To be clear about something, too: you don’t just walk in Strasbourg, you stroll. Naturally, all of the strolling made me antsy, but luckily I brought my Bike Friday New World Tourist - which made France the 10th country I’ve biked in. I had no aim, no goal, nothing I wanted to particularly do other than stretch my legs after an intercontinental flight. I allowed one street to turn into another and, while I had the usual Area Map with me I didn’t use it much. Strasbourg’s layout and landmarks make it a happy place to get lost. 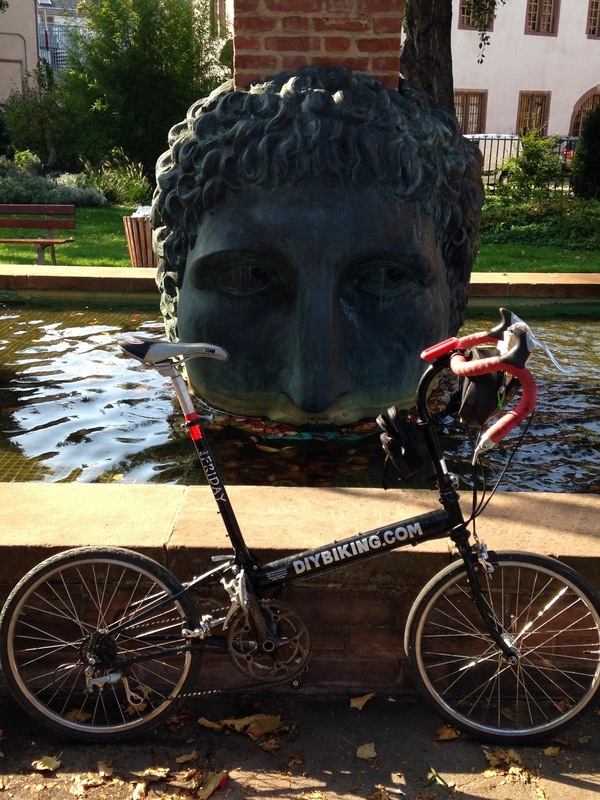 Another big reason to put Strasbourg on your biking bucket list: you can cross off another country while you’re in town. 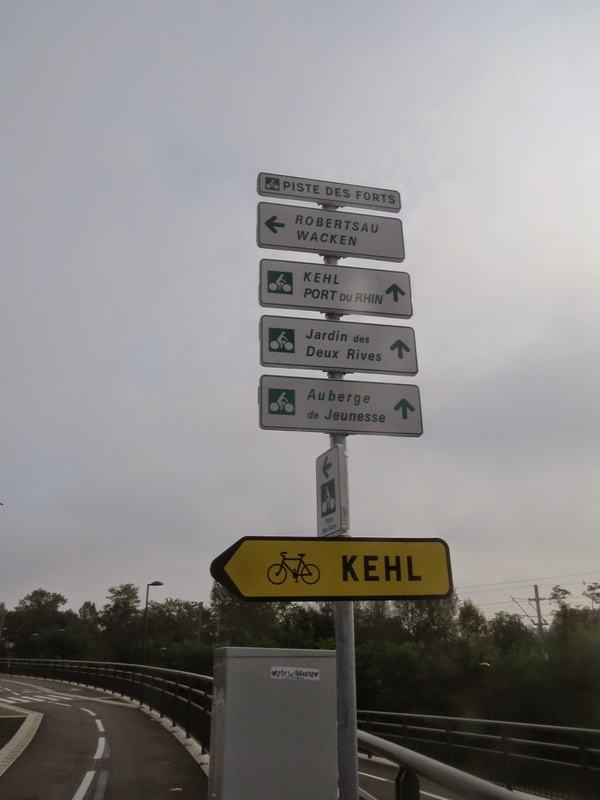 That’s right: there is a bridge that crosses the Rhine and leads right into Kehl, Germany. I crossed it the following morning: my wife, who made some beautiful sketches in Strasbourg and planned to sketch again, said she wanted a pretzel from Germany. It’s as good a reason to bike to Germany as any, so I agreed. Strasbourg’s network of trails made it easy to find the bike & pedestrian bridge, which is hard to miss. Years ago I remember feeling tremendous excitement when I crossed the state line into New York state for the first time (part of me may have just been happy to leave the bike-unfriendly pit of despair known as Greenwich, Connecticut). That was nothing compared to the strange thrill that came from stopping at the base of the bridge and realizing Germany just became the 11th country I’ve ridden in. I didn’t think I was going to stay long in Kehl. I was on a mission, and after only a few minutes, I accomplished it. In fact, it was such an easy trip I decided to stay a little while. First I headed up and down the trail on the German side of the bridge. While there, I spotted a UFO that had landed. I’m sure the backstory of this object is more interesting than that, but that’s a tale for someone else to tell. I also headed up toward Offenburg but didn’t make it all the way there. After all, I still had a pretzel to deliver. On the way back I passed a station that knows how to do bike parking a whole lot better than any of the Metro North stations in Connecticut. Nearly brought a tear to my eye, it did. Closing in on the border I stumbled across two other Americans on Bike Fridays. I struck up a very brief conversation with them, and if they are reading this I must apologize for pedaling on ahead and not riding with them: You were really nice but I didn’t fly all that way to hang out with people from Oregon - and, more importantly, I had a pretzel to deliver. Back in Strasbourg I paused on one of the bridges. I did need to finish bringing the pretzel to my wife but I knew this would be my last ride in France for a while and wanted to savor the moment. And there you have it. Due to the hours I was there I didn’t have a chance to visit any bike shops or even make a dent in the places one can go in this area, so as we were sharing the pretzel, my wife and I both agreed we needed to return to Strasbourg one day. If you too have been there I hope you can also return, and if you haven’t I hope you can go for the first time. Thanks for reading and thanks for riding.